Due to its ergonomically curved design, HASTE RIVIERA group offers excellent comfort. Chairs, love seats and 3-seat benches can be combined with HASTE RIVIERA recliners to create a variety of dining and relaxed-group settings. HASTE RIVIERA recliner with gently-angled slats adjusts to five positions. 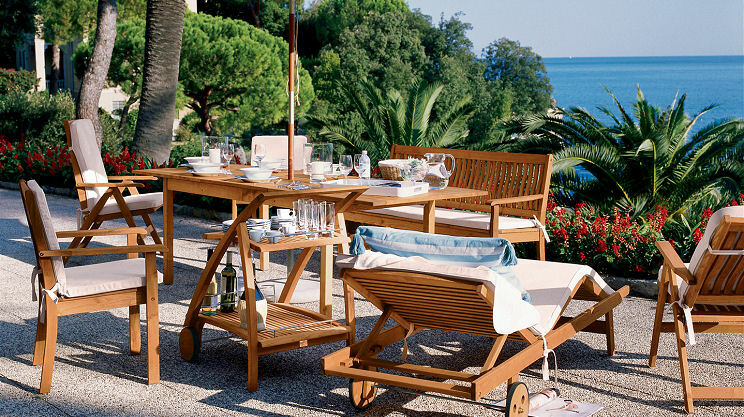 The HASTE RIVIERA chaise lounge in robinia retains its natural pure beauty in the face of time and weather. The slated backrest adjusts to four and a leg support section to two positions. When flat, the piece becomes a comfortable bench. The wheels allow it to move easily.